One of the procedures we go through with every single hardwood floor that we stain is called “water popping”. It sounds kind of funny doesn’t it? It’s also called “grain popping” or “raising the grain”. Basically, water popping is a process used to open up the grain of wood flooring. Well, once we’ve completed several sanding passes with various paper grits – from course to fine – the hardwood floor naturally becomes extremely smooth. The hardwood floors grain has become closed and tight, or in other words, it isn’t open or porous enough for it to accept stain properly and evenly. Most of the stain will sit on top of the closed, tight wood grain and not penetrate deep enough. Then when it’s wiped off, the majority of the stain will be removed as it hasn’t soaked into the wood effectively. By applying water to the wood before the staining procedure, it re-opens the grain and makes the hardwood floor porous again, allowing for much better results with the staining procedure. the grain to absorb more of the pigment. deeper and result in a stronger finish. How Is Water Popping Done? You can do this procedure in a number of ways. Some like to use a water jug and a T-bar to pour and then spread the water around the floor. Others use chemical sprayers to mist the floor with water. Some use a buffer with a soaked carpet pad. We personally use the more time consuming, but more certain and safer method of a bucket, a rag and getting down on our hands and knees. Doing it this way allows us to getter a much closer view of what we’re doing as opposed to a 6ft view standing up. If any tiny spot is missed in this procedure then the stain job will be ruined and you would have to start all over again. Not something we’re willing to risk. The 15 extra minutes to do it right the first time is worth the extra effort we feel. So basically we wipe our wet (but not soaked) rags over the floor, overlapping the areas as we progress to make sure no spots are missed. It’s super important that this is done very evenly. You can’t have a huge puddle of water on one section and then another section is hardly damp. If its water popped unevenly, then the stain will soak in unevenly as well and the floors will look blotchy. Definitely not the results you want! If this happens, the only way to rectify it is a complete re-sand. All that time and money you just spent to get to this stage will have been wasted. It’s also important to note that you need to use very clean water with this procedure. If the water has any contaminants in it, it could react with the stain or finish and give you a huge headache down the road. Once the entire floor has been water popped, we wait for it to dry. The time for this can vary because of weather and humidity etc. but usually after 1-4 hours it’s ready. When the floor has dried, you’ll see that it has become quite rough looking and it’s no longer smooth to the touch. This means the floors grain is now open and ready to accept stain. Once we’ve double checked the newly water popped floor to make sure nothing was missed and for even coverage… it’s then ready to begin staining. Let’s look at those 4 benefits we mentioned at the start of the article a little closer. 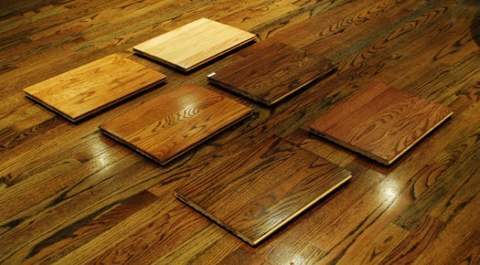 As was mentioned previously, there are numerous sanding sequences used on a hardwood floor refinishing project. As the belt sander, edger, buffer and TRIO are all used across the floor with different paper grits. During each sanding stage, the floors grain closes and tightens more. This doesn’t occur evenly though because of the nature and technique of the sanding machines used. The area in the center of the floor may have more open grain than the perimeters because two very different machines are used. When the floor is water popped properly, all of the hardwood floors grain is evened out and becomes equal. Now when the stain is applied, there will be no worries about any areas accepting the stain differently and you ending up with a blotchy floor. Many people have been choosing darker stain colors the last few years. It is a very dramatic and classy look when done correctly. The problem is that a lot of homeowners have visions of nice, deep dark floors but when they see lighter results than what they were expecting, they’re not happy. The secret to dark, evenly stained floors is water popping. As we’ve talked about, when the floor is smooth, the grain is closed and the stain doesn’t have enough wood fibers to soak into. This is why floors come out lighter than what you see in your stain sample – most of the stain is wiped of leaving very little that has penetrated into the wood. When the floor is water popped, the grain is fully opened and now you have the perfect surface for the stain to soak into the wood and provide that deep, dark rich color that you were after. ALWAYS make sure you ask for a water popped sample before committing to a color though. The shade you have on your stain sample may be very different to what you end up with. This is a little bonus benefit you get from water popping. 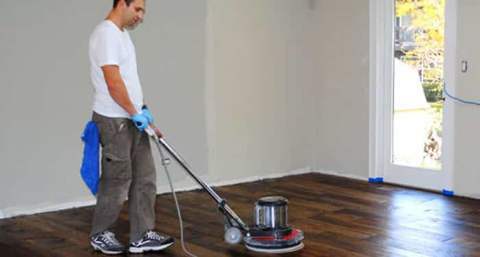 Of course the floor should be sanded to an extremely high quality before any staining should be started, but no-one is perfect and we can all miss some of those tiny sanding marks – especially from the very aggressive edger. In a non-water popped floor, the stain will leave a darker shade in the missed sanding marks, leaving then very noticeable. When the grain is raised from water popping though, any tiny cross grain marks are minimized and blended into the woods fibers. We think of it as that tiny extra bit of insurance. Benefit 4 – Finish Will Penetrate Deeper and Result In a Stronger Finish. It makes sense that, seeing the wood fibers are raised by the water popping process, there is more hardwood floor “surface” for the finish to stick to and soak into. This is in fact what happens. The first coat of finish goes on very thirsty as it soaks into the grain and flows out across the surface. Because the popped grain is very fibrous, the first coat has much more surface to grab onto and penetrate into. This results in a much stronger coating compared to just coating over a smooth, closed grain hardwood floor. This isn’t a huge difference, but again one of those extra little bonuses you get from using this procedure. After a floor is water-popped, it is extremely delicate. We take great caution when moving around on an open grained floor. Any little scuff mark made from a misplaced shoe movement will result in a lighter area on the floor and thus a complete re-sand. If you attempt this procedure yourself, please be super, super careful between the stages of a dried water popped floor and staining. We suggest socks only. If you are going to try this on your own floors, also be aware of how much water you apply to the floor. It is vital that you coat the floor evenly and not wet the floor too much which will result in blotchy areas. Also allow sufficient time for it to dry properly before applying stain. The outcome of a water popped floor will vary based on certain factors like the type of wood, the amount of water used, the length of drying time and the color and brand of stain applied. We always test first before committing to a whole floor and we highly suggest you do the same if attempting this on your own floors. Our professional opinion is that it’s better to leave water popping and staining of hardwood floors up to the experts. We have spent years perfecting our techniques, and both water popping and staining – while not extremely difficult – have many failure points that could easily and very quickly ruin all the time, effort and money you’ve put into your hardwood floors. We know many people from outside of the Naperville, Illinois area read our blog, so our advice to you is to ask your hardwood floor refinishing professional for references from previous water popped jobs. Ask lots of questions based on this article to see if they’re knowledgeable about the water popping process. And most important, don’t forget to ask for samples of your stain color choice on a water popped and a un-water popped wood sample. Thank you for a very clear instruction on popping wood floors. I am going to be staining some red oak stair treads. After water popping and staining, do you lightly sand the wood before applying finish, or leave it alone and let the finish smooth out the finished product. You’re welcome Frank. You’ll want to put a coat of finish on first and then you can lightly sand it to smooth it out. Don’t go crazy on the first coat though, wait until the second coat to make it super smooth. Hi Jim, you could definitely give it a try if you like, there are guys out there that do. There wouldn’t be any real significant benefit though and it would add additional cost to the job, plus like you said “less grain pop” so the color won’t be as intense. I’ve just recently stained my floors withOUT water popping and the color is leaving a lot to be desired. I’m going for a rich, dark brown and after 4 coats of dark walnut, jacobean and ebony, the floor still looks…like it did before I started. I have yet to put the polyeurathane on; is it possible to complete this water popping AFTER I’ve stained? Sorry to be the bearer of bad news… but you can’t water pop after you’ve already applied stain :( You’ll have to sand it down to bare wood again, water pop first and then stain. Hope you get the color you want! Sorry to hear about your troubles. Wow 3 sands in a few weeks! Your poor floors. I hope you don’t have to do it gain, you’ll have no wood left. So were the floors stained? I wasn’t to clear from your post. It is hard to give advice without seeing he floors in person but I would wait until the second coat before starting to worry too much. Usually the first coat of finish doesn’t look too good in general. The next coat should even things out. Hopefully it works out this time. If not you really need to get a professional in that knows what they’re doing. Im a builder in NJ. Finishing a 1.5M house and having nightmare with ebony floors. have been done 3 times in 2 weeks. High lows, dull and shiny, white haze. Any suggestions? They did 2 tries with oil poly and 1 with Abso?? water/oil? These are beautiful white oak top grade. Sounds like your guys are not very capable. You need to call in a professional floor refinisher to sort out what the issue is. There is no way a floor should be finished 3 times in 2 weeks and still have major issues. If I was close by I would come out to have a look myself. I hope you can get someone to for this out for you soon. Good luck Libby. If I have my floors water popped, will a dark walnut stain be a dark brown? Do we need to add Jacobean o Ebony? We have white/red oak floors that are in great shape. Having them refinished. Had them sanded and stained last week. Major disaster! Bad color and very blotchy. They did not water pop. Now they are re-sanding and will water pop. Also, I think they use mineral spirits in the water pop process. Is this ok? Sorry your having problems with your floors. As far as stain colors, always do tests of different blends in an inconspicuous area or on scrap pieces first. That way you’ll be able to find the perfect color for your floors. Your flooring contractor should be helping you with this. Not sure why they would use mineral spirits as it wouldn’t raise the grain enough (plus it would stink up the place and add a lot of fumes), are you sure it wasn’t denatured alcohol? Hope this try gets it done for you Laura – good luck! Thanks for the info. We now have another problem. The 4th coat of water based poly was Minwax Polycrylic. We now know that it shouldn’t have been used on the floors. Only the 4th coat is this Polycrylic. Can we put a water based oil modified polyurethane on top of the polycrylic without screening? The first 3 coats were a water based oil modified polyurethane. To be completely honest with you, these products your guys are using are low cost DIY big box store type finishes and we don’t have any experience with them and would certainly not use them on our clients floors. But I had a look at the Polycrylic finish and yes, it definitely shouldn’t be used for floors. And yes it should be screened. My full cover-all-your-bases suggestion is to test to see if the 2 finishes will adhere properly to each other by screening a small area, cleaning it well and applying a top coat. Wait a few days for it to cure and then do an adhesion test by cutting cross hatches into the finish and apply some clear tape over the top and rip it off. If it has bonded well, you shouldn’t see any finish on the tape. You can then be certain it will be OK for the rest of your floors. As far as professional hardwood floor finishes go there’s no such thing as a “water based oil modified polyurethane”. Minwax is basically using that as a marketing term – very clever but very misleading too… although technically they’re not lying. I hope you get everything sorted out and you can soon be enjoying your floors. thanks for your help. We are following your suggestion! You’re welcome Laura, hope all goes well. Thank-you so much for your articles/blogs. I only wish I had come across them sooner. My husband and I are in the process of having our nearly 100 yo maple/inlaid oak floors refinished professionally. We did them ourselves 13 years ago and were pleased with the outcome, however I am expecting in Nov and did not feel comfortable taking on the project ourselves once again. I have several concerns/questions and have found our refinisher to be difficult to talk to. From the get go we have wanted our floors stained to create a warmer feel in our 1920’s arts and crafts style home. We have shown him pictures taken after they were last refinished to help him understand our goal/expectations. He was very reluctant to stain, but did agree to it eventually. He brought 2 dura seal colors to test on the floor which didn’t appear to change the color much at all except to accentuate the blotchy character of maple. I suggested waterpopping which he initially disregarded due to ” increased blotchiness” with use, but after checking with another professional he agreed to use the technique. Our floors are not perfect and gaps are present. The area that was water popped is approximately 650sf. He did the process with a bucket and rag as you do, however he only used about 2/3 a gallon, and the floors do not feel or look rough as I would have expected based on this info provided. I’m worried that too little water might only pop the already open areas and not have much impact on the closed grains which would I assume accentuate the blotchiness. The floors were popped yesterday, and the contractor plans on returning to stain tomm or Friday. Then to make matters worse we have a storm last night and developed a leak over the middle of a water popped floor. We did get it wiped up right away, but I’m worried about the effect it will have on the outcome of the stain. And finally I am concerned about the finish. He recommends and routinely uses glitsa gold seal light scent which as you said is high in voc’s and contains multiple chemicals known to cause birth defects. I am hoping for a satin finish (I really don’t like anything too glossy) but after reading your reviews I’m afraid my gaps in the flooring create an issue. The total project is a little over 2000 sf and includes 2 stories (everything but a bathroom). I would be willing to invest more money into the project to achieve a better/safer outcome. I have 3 children and a dog and anticipate moderate to heavy wear and tear in certain areas with very little in other areas. Any advice is greatly appreciated. Sorry to hear of your troubles with the leak. To be honest, I would postpone the refinishing and get the cause of the leak repaired ASAP. You don’t want to take a chance of it leaking all over your wet finish or doing other damage later on. Wood and water do not get along well! The other issue is that you’ll need to at least buff the floor again and re-pop it because I’m sure there will be crushed patches from rushing around trying to mop up the water leak. Plus just the water leak on the floor would make me re-do it anyway. Make sure there is not too much water used with the popping too, it just needs enough to be damp, not soaking. I’m not to sure from your comment how much oak you have vs maple but the oak will have much more texture compared to the maple so don’t stress out too much if there’s a difference. As far as finishes, if you want a low VOC satin finish thats tough I would suggest using a two component water asked finish system on top of the stain. If you get the refinisher to roll it instead of using a t-bar the big gaps won’t be an issue. Hope that helps Kristina… Good luck with the project. I am refinishing my red oak floors. I picked a dark stain. I used a sprayer to applythe water. I know the water was sprayed unevenly in some spots, I can see the marks where I already applied the stain. In the areas I have not applied the stain can I re-do the water pop with a rag and water? I really do not want to resand. If I do have to resand can I just do it with 80 grit? Honestly, long-term you will be better off re-sanding the floor. The blotchy areas you’ve already stained will annoy you for a looong time after you’ve forgotten what a pain it was to take another day to sand it back. You’re at a point where its an easy and cheap fix compared to deciding to do it after applying the stain and finish. This time do it on your hands and knees with a bucket and rags. Water sprayers work but you need to know what you’re doing to get it even as you found out. Yes you can start with 80 grit this time. You won’t need to sand much off. Hi there, I’m wondering if applying a pre-stain wood conditioner would give the same effect as water popping? Also, if you water popped, would you have to apply a pre-stain afterwards, or could you just do either one or the other? Which brand are you thinking of using? 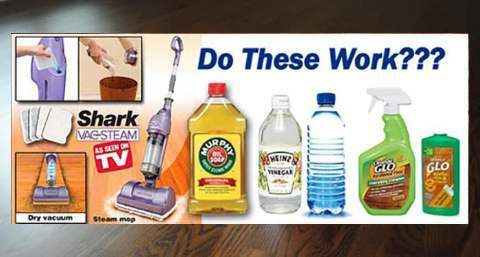 Most pre-stain treatments are oil based which gives a different result from water. Usually they are used for furniture as you don’t have a lot of working time with some brands because if they dry the stain won’t apply properly. Water popping is much more user friendly for big areas like floors, it works very well, you’re not racing against the clock and it is much cheaper. After water popping do you still use wood conditioner? No we don’t use a wood conditioner after water popping, just stain. Hi Tadas! Thanks for all the great information. We have white oak throughout a flip house we’re working on, and not totally happy with the final feel of the floors (after using a drum sander using 24, 50, and 100 grit and the edger using the same), so we are renting an orbital with 3 heads, using 80 grit (to get rid of tiny cross-hatch scratches we didn’t see standing up) Once we “level off” the entire floor throughout, do we need to go to a 150 as a finisher, or because of water popping will going that smooth be unnecessary because popping brings out the fibers and makes it rougher? Will 80 grit be too rough as a final pass? I know you prefer a rag to pop with, but what about a sponge? Would that help to stay more even to avoid blotches? And just to be clear, the floor should be more than just damp, it should look wet, but not have puddles, right? What brand of top finisher do you recommend? Depending on the wood then yes, 80 grit should be ok. 150 grit is too fine. 80 – 100 is a good grit for most floors. If a sponge is easier for you it could work I guess, we like fresh clean rags the best though. Yes no puddles, just enough for it to be damp and not soaking. As far as finishes we recommend either a 2 component waterbased finish or a hardwax oil. As far as brands… Pallmann, Loba and some high-end Bona finishes should do you well. We are in the process of having our red oak hardwood floors refinished. They preferred to water pop. One guy used water and the other followed behind. They said they waited ten minutes before starting to stain with dura seal dark walnut. The next day they put 2 coats of bona traffic hd and are scheduled to return tomorrow for 3rd coat. They said it was from old poly caught in between the boards. Our other rooms that were done recently without water pop-by someone else-don’t have any of that. Could the waviness and the dark looking stain along some long seams be due to improper water popping or waiting time for drying? It’s very hard to know what could be the cause without seeing the floors in person but yes, it could possibly be because they didn’t allow enough time after water popping before staining. 10 minutes is definitely not enough time for it to dry properly. I hope you can get it sorted out. After some experimenting on sample white oak planks we’ve found the finish we like: Rubio Monocoat “Pure” on top of their Pre-Color Aqua. Basically the target is to avoid ambering – keep the natural unfinished color. By applying very little of the Pre-Color Aqua and immediately wiping it off we avoid white streaks in the grain and get the color result we want. … BUT – the water based Pre-Color Aqua ‘pops’ the grain. So now the surface is rough instead of smooth. Should we lightly sand after the Pre-Color Aqua dries and then apply the oil? Or should we “pop” the floor, lightly sand, then start with the Pre-Color? The grain shouldn’t pop again – correct? David, do you have any pictures to share of your completed floors? I, too, am trying to keep the paleness in my 4″ select white oak when having it finished. Sorry I missed your comment. Yeah you should buff the Pre-Color Aqua with a maroon pad before applying the oil. Thanks for this tutorial – I am reclaiming planks from pallets and going to panel a feature wall. Many different species of wood ans intend to create a checkered look and think this will improve the look. Good luck with your project, sounds like fun. Hello… We just purchased a home w maple floors. We are in the sanding process, right now. We didn’t sand well enough, the first time. So will be doing another round, today. I also found out yesterday how difficult it can be to stain maple a dark color. I think we will try water popping, instead of a prestain/shellac coating prior to staining. What type of stain would you suggest to use after the popping, on maple? I’ve read a lot about using a gel stain, but that was always putting a shellac layer first. Yes we definitely water pop maple floors. This is one of the most difficult floors to stain evenly, even for professionals! 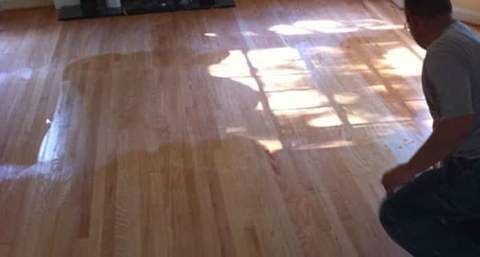 We use Duraseal stains for maple. So, I have stripped my handrails to bare wood and the bullnose under the balustrades. Do I use a rag with water to water pop these too? Yes you can use a rag. For the corners and hard to reach places try a brush if the rag won’t get in there. Good luck with the project! We’re having our 40-year-old white oak floors refinished (they’ve been covered with carpet since the house was built). We’ve decided on the Bona Spice Brown stain and the Bona Traffic Satin Finish. I found the article on your site with the amazing fumed floors with the spice brown and fell in love, but my floor guy doesn’t do fuming, which is fine – I’m glad he was honest! So now I’m trying to decide whether we should have him water pop. His initial reply was that we might not want to go that dark… I love a dark, rich floor, but not so dark that dirt and scratches become my nightmare. Based on your article it sounds like you always recommend it??? Thanks! Yes we water pop every stained floor we do. A sander professional is going to do my 1890’s maple flooring. He said all the right stuff. I’m going to refinish it. I want shinny, and don’t like the look of polyurethane. Will use dewaxed shellac. Is a water base stain OK to use? Sorry for the delay, it’s our busy season. Yes that should be fine. Just make sure it’s dry before applying the finish. And make sure to do a test spot first too. We just completed our second floor using the Precolor Aqua 01. We found that unlike the directions, we had to wipe it off almost immediately, in order to avoid lap marks. We put it on with a roller, and wiped it off with cloths. We’re doing a 750 sf room tomorrow morning… so if you have an answer soon, that would be great! The second question is, when applying the 2C oil to a floor that had received precolor Aqua 01, and then Precolor Easy, is there any harm to immediately going back and buffing in another application of the 2C oil? I ask, because when doing floors, we noticed spots that were more dull than the rest of the floor, as if they had not absorbed enough 2C oil. Once we rebuffed with a bit more product, they looked great. A few minutes later we hit it with a clean white pad to remove any residue. Turns out we did end up applying the Precolor Aqua 01 with a roller, and then going over it with a buffer with a red pad to remove/spread it. We were working on two large rooms, and they came out looking great. We got them rather white by using the Rubio Precolor Easy Nordic White as a second coat, and then using the Super White 2C Oil as the finish. We’ll be repeating that same process for another couple of large rooms today. The process is pretty easy, other than the Precolor Aqua 01. We had a couple of instances of using that where it was not absorbed 100% evenly. That might have been an issue with the prep (even though it had been carefully done at the time). So the rooms we’re doing today will be the final test, since the prep is meticulous. No there is no problem rebuffing the dull spots with more oil. Although it’s much easier to put down the right amount first and get it in one shot. Just make sure ALL of the excess oil is buffed off, otherwise you will have issues. I was wondering if when you do the water-popping if you go with the grain or against it, or doesn’t it matter? We go with the grain. We are in the process of having our hickory floors oil stained with a water base finish. The contractor sanded to 100, water popped, then put on the stain. The application of stain has made the wood peel and separate. He tried to patch and re-stain which made it worse. He has now pulled out the board and put in a new board, sanded/stained — but it looks horrible as you can see overlap marks. He went ahead with the 3 coats of water base finish over past couple of days. Now I am seeing more board split. This is a split in the board, not the finish cracking. What could be causing this and how can we prevent? I am also very unhappy with the amount of swirl sand marks and spots which appear to have too much finish or debris under finish. How do you suggest we handle these concerns — Am I being to picky, are these normal and to be expected? Thanks for your help! The boards splitting should have nothing to do with the finish. It seems like it is not good quality flooring to begin with. Is it engineered flooring? Sounds like it. Good flooring should never split like that regardless of what finish process is used. My guess would be that the contractor used too much water in the water popping process and that’s what could have caused this issue. It’s very hard to say without seeing it in person though. As far as the swirl marks and debris, there is a small amount that would be acceptable. Usually the industry standard is if you can’t see them from a standing position they are passable. We like to do much better than that, but everyone is different. If you’re not happy then call the contractor up and let him know. Have you paid them in full yet? Hopefully not. In the case i apply Water popping before stain and aplly Primer and top coating, How long from apply water popping to Apply prime? Please help me advise!! I use Stain, primer, top coating from Bona. Thank you. That would depend on the stain, sealer and finish systems used. But generally if you water pop, wait till it is dry before applying the stain. This may vary depending on the weather and humidity. You can use a moisture meter if you want to know exactly. Then the stain drying time would depend on the color, whether it is oil based or water based and again the weather and humidity. Dark stains will need more time than light ones. Always read the instructions that come with the product to be certain. In a perfect scenario you could water pop and stain in one day and then seal and apply the first coat of finish the next. This is water based of course. I am so lost. I meticulously sanded and water popped my red oak floors, and the dark stained still dried uneven… they look awful. I’m in the process of re-sanding 1100 SF with my palm sander because that the only way for me to ensure no swirl marks. My question is, do I have to get absolutely all of the stain off? I’m noticing that some spots are sanding to a lighter color than others and I terrified that the color difference will show up (like chicken pox) when I re-stain. Additionally, if I remove the majority of the satin, to the point where all the shine is gone, can I or should I try to water pop the wood again before re-staining? You poor thing, I’m very sorry for you that this has happened. I can’t imaging sanding that much floor with a little hand held sander! Yes, unfortunately all the stain will need to be removed in order for it to look good. Then, once back to bare wood, you can pop the floors again and start staining again. My advice would be to get a professional in with a proper belt sander, edger as well as a TRIO to sand the floors back to bare wood. By doing it with a small palm sander you will never be able to get the floor sanded evenly and flat. It’s extremely hard to get a professional look and finish with tools that are inadequate for the job. I hope the next go works out for you Rosemary. What is the finest grit sandpaper you recommend to use before water popping? I’ve just sanded a large table top with 320 grit and I’m worried that is too fine. Should I rough it up with a coarser grit and then do the water popping? The finest we use is usually 120 grit. Remember that the purpose of the final sand is to remove all the edger, scraper and other tool and rougher sandpaper marks – not to smooth the wood. After you water pop, then stain and/or seal with a first coat, is when you smooth out the wood/finish to ready it for the top coats. What happens if you don’t use purified water? The water needs to be very clean but not necessarily “purified”. You just don’t want any contaminants in it that could react with the stain or finish. Great foum and information! I am renovating the triplex in Boston and the clients want extremely dark ebony floors with a very matte finish. Currently they have red Oak throughout with inlay details on the borders of the family room and living room. We will definitely be water popping the floors but I am curious to find out what brand of stain you would use and whether you would go with a water-based or oil-based finish and how many coats of stain and finish you would need to apply. Also do the inlay details totally get lost in a very dark ebony finish? There’s a couple of options you could go with to make a dark floor. One is use Rubio’s Pre-Color Easy Intense Black with either Pure or Black Oil Plus 2C. This will make a dark floor that will be matte. And yes, most likely the inlay will be obscured by the darl stain. Great article and responses, they are very informative. I’m currently about to lightly pole (120 grit) my dining room floor after belt sanding (i know it’s not the best sander to use for this but I have a lot of experience and I’m quite good with using it – for this smaller project area I trusted myself to use this more than a commercial/bigger rented type) the field and orbital sanding the edges to try and make the sanded areas as uniform as possible. I’d probably use a buffer with a 120 screen but my father is using it so I’m making due with what I have. After this I’ll vacuum and clean everything (ceiling, walls, etc) and then a final wipe down of the floors with microfiber cloths prior to water popping the floor. After water popping the floor I have two options, of which I’ve seen 2 opposite responses and don’t know which to chose. 1. I can wear clean soft socks (or soft painter style “booties”) and walk across the water popped floor gingerly to the area of the dining room under the window and furthest away from the living room (exit) and apply stain, not walking the floor that I’m applying/wiping off what i’m staining. But this requires me to walk on the popped floor. 2. Start applying stain at the living room side of the floor. Not walking on the floor until the stain has been applied to part. Then walk over the partially stained floor (but not the bare, water popped section)to wipe off some stain while standing on the wet, not yet wiped off stained section. I doubt that makes sense but am trying my best to describe my dilemma. From what I’ve read there are conflicting suggestions. I can either walk across water popped floor and apply/wipe off stain like most would (exiting stained room without walking on stained floor but having to walk on popped floor prior to application of stain). Or I can apply stain to popped wood without walking on popped wood but walking on wood after staining it to dry and apply to other sections. I know that sounds long winded and it could’ve probably been summed up in a few sentences and apologize for not being able to do so. I greatly appreciate any help (especially if you can quickly but not I’m not trying to push lol) you can provide and I’m sure if it’s like all the others it’ll be extremely helpful. Again, thank you very much for the great article and comments, you’ve been extremely helpful! Happy to help where I can. To answer your question… Yes you can do option 1. Just be very, very careful. Don’t drag your feet or anything else across the floor. We wear shoes that have no tread but we also use a buffer to apply stain… if you use socks that should be fine. Good luck and take your time. Hope it goes well. Sorry I thought I had replied already but I must have missed you, sorry. Yes you are right, for darker stains always water pop. Yes the whole wood will darken, including the grain, but with the dark color you are considering, it will blend in together better than a lighter colored stain. The sheen of the finish has nothing to do with the color, it just affects how shiny or matte the floor sheen looks. Although in saying that, a glossier finish will give a lot more depth to the color verses a flatter looking satin finish. Ask for samples so you can see both. As far as colors the ebony Jacobean mix you are considering is a nice look. You can play around with percentages to get the exact shade you like. With the process, sand very well (dark stains show every scratch), water pop once, very carefully stain the water popped floor (always stain only one time as well otherwise you will have adhesion issues) and let it completely dry before coating with your chosen finish system. The system you decide on will have a factor on how many coats you will need. Good luck Katie. If we can be of any more help just ask. Hello. I am staining pine wood floors in a 100 year old house. I sanded last week and then noticed that there were footprints. I tried to clean off the prints with a damp rag. Have I in fact water popped that area, and will the result be the stain looking uneven because of it? What should I do now? It has been a busy remodel and many people have walked on the unstained floor, especially in the high traffic areas so there is some pathing. How do I clean those areas before staining and how long after I clean do I wait to stain the floor? Yes if you water popped certain areas they will take the stain differently to the surrounding wood. It sounds like you need to do a final sand again before you stain. Whether that’s with the big machine, a TRIO or a buffer will depend on what damage there is from everyone walking over it. That’s what I would do, I wouldn’t be taking any chances. Once the stain goes down, if you have missed some spots you will be sanding back anyways and now it will be much more difficult. Hope you can get it sorted and looking great. Sorry for your troubles. It’s disappointing when things don’t turn out right. From way over here it would be hard for me to say exactly what the issue is, I would need to inspect them in person. Beech can be a tricky wood to get even color on when staining. Most likely not the cause if your floor guy is a professional, but if he isn’t… Did the contractor sand off all the previous finish? That could be one of many causes. Hope you can get it sorted out and sorry I can’t be of too much help. We will be using Rubio Monocoat Pure (no pre-color) on white oak. Would it be a good idea to water pop before the Pure? I called Rubio, and the response was, ‘sure, you could water pop if you want.’ Just wondering if we would get better ‘grip’ or durability. I have tried on some sample pieces, and can’t tell if there is a positive difference. Yes, we water pop all our jobs. Do lost of testing first though and be VERY careful walking across it and working on it once water popped… it’s very delicate and will show marks through the finish if burnished. Following up on the comment above, I will be having some new white oak floors installed with a mix of quarter, rift, and plain sawn board. I am planning not staining, using Pallmann Magic Oil in netrual color and water popping to accentuate the grain. My concern is that the water popping will give the wood a rough feel. You mentioned earlier than buffing with a maroon pad between stain application and a rubio monocoat would smooth things out. Would this same technique work if done between the 1st and 2nd coats of Magic Oil? How frustrating. To be honest, this isn’t something I would do. It possibly could make it look better, but most likely not. It would be a lot of work too. Personally I would suggest a re-sand sorry. Hope you can get it sorted. We’re about to lay down new 1 1/2″ oak floors (no one does this in South Florida anymore!). I’ve been educating my contractor about all of the things I’ve learned from your posts and am leaning heavily toward Pallmann’s Magic Oil, have ordered color samples and want to experiment with mixing to find that perfect old amber color. Everyone in South Florida is doing water based poly. 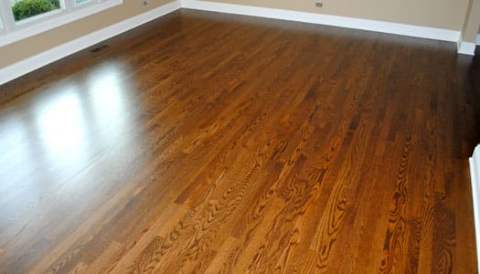 In fact, I had some 90-year-old floors ruined in my prior home ruined (in my opinion) with Bona Traffic, no stain. Completely flat and lifeless afterwards. The Pallmann distributor in South Florida has told me that no one is using it yet, only Rubio Monocoat so far. First question, if a finisher is proficient in Rubio, will that translate to Pallmann? But my real question is, how did you arrive at the finish in your last photo, bottom row, middle swatch? It is the most old-fashioned amber of all 6 swatches, or at least what I can tell from my screen. Please let me know how we can replicate this! What is the stain, finish, etc? As an aside, I have three little kids and would like not to have to constantly correct them about their treatment on our floors. For example, our Bona Traffic floors were horribly scratched and dented almost immediately. Are you sure that’s what they used on your floors? Some cheap guys swap out inferior, cheaper finishes and say it’s a high-end finish like Traffic. It’s a very good system so I’m surprised when you said it was trashed so quickly. Good luck with this next project. I am having an unfinished European white oak installed in my new home. I want to wire brush the floor on site and use Pallmann’s magic oil. I couldn’t find a factory brushed floor that I liked for the right price. Would you recommend water popping before or after doing the wire brushing? Does everyone who walks on the floor between the time of water popping and finishing need to do so in socks? I would water pop after. Either socks or very flat, smooth soled shoes. Either one can do damage if you’re not careful. I have just have my floors refinished a week ago… I was told they used water/alcohol popping… the color looks good but the finish wood floors are not smooth!!! The installer is telling me to wait another two weeks that the floors will smooth out!!! That the water/alcohol will evaporate!!! The floor already have 3 coats of poly. How can it evaporate through 3 coats of poly? What do you think? Lol. I haven’t heard that one before! Sorry, but no, not going to happen. He’s making up stories. Did he not buff between coats? It’s frustrating when you think you’ve hired a pro and find out later they’re not. He’s going to have to buff it smooth and do another coat. That’s going to be one thick finish. Hello. Thank you for your time in answering all these questions. I have pine floors and have water popped them. I’ve done one coat of stain by hand using lint-free rags. I’ve gone wall to wall one board at a time, being sure not to overlap on any boards. The color isn’t as deep as I expected, even in doing a sample area in my closet. Is a second coat possible? I’m using minwax stain. Thank you. If that happened to us we would re-sand the floor. Too risky to take a chance. Hi, great information on your site. Sadly I’m not in your area or I’d use your expertise. I’m leaning towards the Rubio Monocoat for our old hardwood floors. Being that the stain is in the product, would you suggest water popping the floors prior to using this product? We had our previously carpeted staircase treads replaced with white oak treads to match the hardwood floor installed a year ago. The floor done by a flooring company, was water popped & is smooth & gorgeous. The treads were done by a staircase remodeling company & are not smooth or even attractive. They water popped them, stained, finished & have installed them. They have what looks like raised black bubble-ish kind of stuff over all the grain. They are rough when you run your hand over them. You can visually see the roughness from a distance if 3 ft or more & if the light is reflecting off it from 5ft or more. The blackish crud on them is ugly. I’m thinking either they used too much water, didn’t wait until it was throughly dry before staining or didn’t sand between finish coats. Please tell me what the problem here is so I can tell them they need to sand & refinish each tread. Thanks for your help! I have a couple of questions. I live in a newer home with red oak floors. They were varnished, I’m guessing, with an oil base finish with no stain. eight years ago when we bought the house the floor seem to look much brown. Over that eight years it has turned more of a yellow orange color. I would like to have the floor re-sanded and restained a light color. Is there a stain mixture that would help to camouflage the pink tone without being real dark? The man who is refinishing my floor plans to water pop it. He has a lot of experience, and he knows what he’s doing. The only problem is I am concerned that the grain will show much more after water popping, and I don’t want the grain to be more prominent. Am I right about water popping making the grain more noticeable? Is water popping important if I am staining with a lighter stain? Years ago I sanded and stained all of the floors myself in an old Victorian home. I used a waterbase finish by Zar, which they don’t make anymore. The finish was many years old and wore well. The man who is doing our floors is not thrilled with water based finishes. Do you feel they’re OK. The main reason I wanted water base is because I do not want the yellowing or oranging of the floor. Thank you so much for this site. I look forward to hearing from you.